Sandra Busby is a still life artist, who is most recognised for her paintings of glass and other reflective objects. She describes herself as a ‘late bloomer’ as she was in her mid 30’s before she began taking her art seriously. Since then her work has been published multiple times and her work hangs in private collections around the world. Tara Roskell is an artist, creative thinker and graphic designer. After over twenty years working in the graphic design industry, she is excited to be rediscovering her love of creating art by hand. She is also passionate about creative thinking techniques which can help anyone kick their fear of the blank page. Selfie of us when we finally met this August after knowing each other online for just over a year (Tara left, Sandra right). Sandra was completely unaware that we were going to meet as her husband Paul had arranged it as a surprise. Carrie: When did you first realize the importance of art in your lives? I was always someone who needed something creative in my life, even if it was just doodling in the margins of my exercise book at school. When I was growing up it was dancing and a bit later, I took singing lessons. But I married young and when I had my first child, creativity wasn’t something I considered at all. By the time I was 26, I’d had my second child. One day I decided I wanted to paint a huge mural on their bedroom walls. I turned my daughter’s entire bedroom into an underwater ‘Little Mermaid’ scene and on my son’s wall I painted Thomas the Tank Engine. That was what lit the initial spark. I really surprised myself as to what I could achieve with simple emulsion paint! But I was in my mid-30s before I started drawing seriously and suddenly I realised how much I’d missed it. And it changed everything…. I’d found a real passion for something. So, I decided to enrol in an art course to brush up on my skills and from that moment I’ve never looked back. Not having art in my life now, would be unimaginable to me. From a very young age I wanted to be an artist. I used to constantly draw in pencil, but had a bit of a hang up with colour, so I tended to stick to black and white. When I was about 14, a teacher persuaded me to go to an adult evening class to learn watercolours. This taught me the basic watercolour techniques and it became my medium of choice up until I went to art college. At college I did a two year general art and design course and the first year was absolutely amazing. It completely opened my mind and creative imagination. Whereas before I would only draw or paint what I could see in a very traditional manner, at college I was taught to experiment and use mind maps. It really changed both my art and my way of thinking. After that course, I went on to study graphic design, mainly because I didn’t really know where I wanted to take my art. Then I became a graphic designer. My career killed my love of creating art by hand and I no longer had the urge to draw for fun. When I did create, it was always with commercial intent. It was only after connecting with Sandra and the two of us trying a crazy creative challenge that I started drawing by hand again. So if the two of us hadn’t connected I probably wouldn’t be drawing now. I’m a still life painter and I’m drawn to reflective objects, particularly glass. People often describe my work as ‘realism’, whereas I see it more as a ‘romantic truth.’ I like to bring out the beauty of the things around me… So I will take an object and try to bring out those beautiful qualities in the paint, but then I will push back the things that I’m less drawn to. That’s why I wouldn’t call it realism… because I paint the objects around me, but as I choose to see them. I would describe myself as a sketcher who enjoys drawing very loosely and quickly, especially timed drawings. I feel that this gives an energy to my drawings. In general, I prefer dry media like watercolour brush pens, pastels, and pencils, that I can add water to later. I like the immediacy of these methods of adding colour, with the ability to create painterly effects. Although saying that, I have been dabbling with watercolours lately. Experimentation is also important to me. I like drawing in different styles, trying out different mediums or working over collage. My favourite subject to draw is faces. Carrie: What do your workspaces look like? I’m very lucky that my husband converted our garage into my art studio. The best part about that was that I was able to decide where everything would be, from the sink to the easel! My studio is light and airy… The walls are plain white and so are the surfaces. But I’ve decorated it with fake leaves and berry lights to give it a warm, inviting feel. Along one wall I have my painting table and near to that is my standing easel. I have my paints hanging up on the wall within easy reach. Further along, I have my drawing desk. This is where I focus on sketching and drawing. Along the other side is my sink area, plenty of storage space, my shadow box for setting up still life and a large mirror, which bounces the light around. I like to keep my studio clean and organised. A lot of artists function really well in chaos… but I’m not one of them! My partner and I turned our garage into my graphic design office. On two walls of the room I have wide worktop style desks. One side is for my computer and printer and the other for my art. I also have posters on the walls with character designs and doodles (Jeremyville and Jon Burgerman) and an original character painting by a street artist. As I generally use dry media, I sometimes prefer to just sit in the lounge with a sketchbook on my lap. Unlike Sandra, I can be pretty untidy, so I now have a lot of plastic drawers and boxes containing my art materials. This was my partner’s idea to tidy up my office (he’s a lot tidier than I am). Carrie: Tell us about Kick in the Creatives. How did this project get started? It all started when Tara contacted me and asked if she could interview me on the Podcast she was hosting at the time. I was happy to talk to her, if not a little nervous. But talking to Tara was really easy. It was like talking to someone I’d known for years… we just seemed to have a connection straight away. Once Tara had stopped recording we stayed on the line and chatted for some time. I mentioned how brave I thought she was, hosting a Podcast and she suggested I should host one myself. I laughed at that and told her that there was no way I could ever do that! Certainly not on my own! I said I could understand people co-hosting but to do it herself I thought was amazing! Another Sketchathon September Challenge page from Tara Roskell – Sketch drawn while on holiday, this time a cartoonified version of Tara’s partner and their dog. A few days later, Tara emailed me and said that if I ever fancied co-hosting an episode with her, to let her know. I thought she was bonkers at first, but after a few emails back and forth, we decided to do it. Then one episode turned in to another and eventually we did an episode which involved challenging each other to do various creative things. Tara had been doing Graphic Design for years and it had been a long time since she had drawn by hand for fun. It was the little challenges we did for that episode that re-ignited her love for drawing. And I learned a lot from those challenges too. We started talking about how little creative challenges can really help to form a creative habit. Over a few weeks, we came up with the idea of building a website where all of the popular online creative challenges could be found under one umbrella. And we also decided to create our own challenges too… each designed not just to have fun, but to really help develop and improve people’s creative skills. And so Kick in the Creatives was born, as was the Podcast to go alongside it. Carrie: What do you hope listeners take from the podcast? We like to keep it real… So, if we’ve recently struggled with a creative block, for example, we will share that. There’s no pretense that we ‘know it all.’ The fact is, we have struggled with issues as everyone does. Our aim is to share what we have learned from those struggles with our listeners and hope that it will help them. But we like to keep it light-hearted and we have a lot of fun during the episodes, which often takes us in some rather ‘unexpected’ directions! We get a lot of lovely messages from listeners who tell us that they’ve had a really good laugh while listening, but more importantly that they’ve also found it really helpful and encouraging. So if we can encourage our listeners to create and also make them smile along the way, then that makes us really happy. Carrie: What do you wish you knew that you now know about your creative process? I wish I’d understood the value of a sketchbook much earlier than I did. I also wish I’d realised the value of ‘failures’ right from the start. Over the last 10 years or so I have read a lot about creative thinking techniques, I wish I had known more of these techniques a lot earlier. I also wish I had tried creative challenges much earlier and learned how much difference continuous practice can make. If I’m stuck on a particular piece of work, then the best thing for me to do is to turn it against the wall for a couple of weeks and look again with fresh eyes. Sometimes you can look at something for so long that you stop actually seeing it. Another tip is to look at it in the mirror, or take a photo of the piece and upload it to a computer. This allows you to detach from it and by doing so, you will notice things you otherwise may not. For design type projects, my go-to method is mind mapping, but I am also a big fan of introducing random words and pictures to spark new ideas. With regards to drawing and art, when I recently had a block I found that switching the way I was drawing and the type of subject matter really helped. For example, I tried drawing immediately with colour without using outlines and also creating pages with multiple sketches on them. Sandra has always thought it was funny that I only wanted one drawing on a page and suggested I should try it. I initially said no, because I’m stubborn like that, but then decided to give it a go after all. Where do I start? Imposter Syndrome? But I’m not even sure I’m over that! My inner-critic? But she still appears on a regular basis! Time management? Although I am getting much better at that… As a creative, we are constantly faced with hurdles and just as you get past one, along comes another! But if you are passionate about what you do, you will pursue it regardless! I think the worst thing I’ve experienced myself is a creative block. If that happens, first of all, I have to keep reminding myself that it’s purely psychological and that it will pass, even if it feels like it won’t. Then I will look back to the weeks that led up to it and try to figure out what was the trigger. Sometimes it’s simply down to being burned out because I’ve been doing too much or spinning too many plates. In this case, I will give myself permission to take a break for a couple of weeks to recharge. Other times it can simply be a lack of inspiration. In this case, I will take myself off to a local art gallery or somewhere else inspiring so that I can top up my creative well. Sometimes a block can go much deeper, depending on what else is going on in life. These blocks are the most difficult to get past, but the first hurdle is working out the cause. That way you can look at ways of dealing with it. I guess one of my biggest hurdles was losing my love of drawing by making it my career. I forgot that drawing can be done purely for the pleasure of creating, rather than for commercial reasons. I didn’t believe for a long time that it was something I would ever get back. When I was a young designer I used to desperately want to be given creative briefs, but as I got older I realised that didn’t really scratch my creative itch. Then I preferred to do less creative work, just to get the job done quickly so my creative brain would have the energy to work on my personal projects. These projects ranged to coming up with product ideas, creating characters, blogging and now back to drawing and Kick in the Creatives. Like most artists, I also have fluctuations in confidence about my work. Sometimes I can see my work improving, other times I feel like I’ve taken a step backwards. I have to remind myself that that’s a normal part of the creative cycle. It’s very much like a sports person who can be on top of their game one week and then crashing out the next. Carrie: If you could one piece of advice to someone struggling to call themselves an artist, what would it be? A lot of people struggle with this. I used to call myself a ‘painter’ because giving myself the title ‘artist’ seemed so… well, presumptuous? But if you look it up in the dictionary, ‘an ‘Artist’ is a person who creates paintings or drawings as a profession or hobby’. It’s so simple… and yet in our heads, we make it so complicated. There will always be a period when you don’t see yourself as an ‘Artist’ at all… but if you continue with your pursuit, then there will eventually come a point where you start asking yourself the question… ‘Am I an Artist?’ If you have reached that point, then the answer is probably yes. If you draw, paint or create art in some way then you are an artist. Artists come in all different guises, from the casual hobbyist to professional artists. There are so many styles of art out there, it’s almost impossible to compare art. What I love, the next person may hate, or vice versa. It does not mean the person that created it is not an artist, it’s just personal opinion. However, you also don’t have to label yourself an artist if you don’t want to. If you enjoy creating art, that might also be enough. I nearly said my iMac, because I use it for so much; research, blogging, updating my website, deciding on the best compositions, social media, Podcasting… the list goes on! But then I realised that without having a simple pencil and piece of paper, I wouldn’t have anything to go on the computer for! So my answer would have to be a pencil and paper… besides, not only can I draw with that, but I can write down ideas too! That’s a tricky one because it changes for me. I did get a little addicted to a Pentel Chinese brush pen for a while. I still love it, but now it’s probably a good hardback watercolour sketchbook like a Moleskine. These books can take a lot of punishment from both wet and dry media without buckling too much. I’m inspired by people who are not afraid to be imperfect! People who are willing to be bad at something, in order to become good at it. People who are not ashamed of their failures, but who see them instead as the stepping stones to their greatest work. I’m also inspired by the people who aren’t afraid to simply have fun and create… the people who are more interested in the process, than the result. Sandra has definitely inspired me to start drawing again, so I have to thank her for that. I’m also inspired by some of the people in our Facebook Group, who are prepared to give things a go and share their work whatever the outcome. A lady in our group took part in our Abstract April Challenge. She had never tried abstract painting before and loved it. She has been painting abstracts ever since. This inspires me to think that you never know what you will enjoy until you try it. Being prepared to try something new with your art can lead you into exciting and unexpected directions. An Artist, to me, is someone who is able to use their imagination and think in a creative way. It’s the difference between the person who will lay on the sand and sunbathe and the person nearby who was more compelled to make a sand sculpture. To me an artist is someone who enjoys creating and actively does it. I think the enjoyment side of art is crucial, even if we do all have our ups and downs. 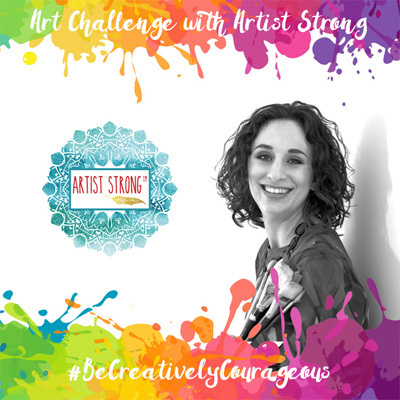 #BeCreativelyCourageous is here: a challenge for the month of October encouraging you to set personalized goals for your art, and giving you the steps to achieve them! If you want to find your voice as an artist, or you want to create steps to finally share your art on a larger scale, this challenge is for you. It's free, too! Sign up here to access Artist Strong's newsletter and as a bonus, enjoy this challenge, too! Mark those calendars: we begin October 1st.